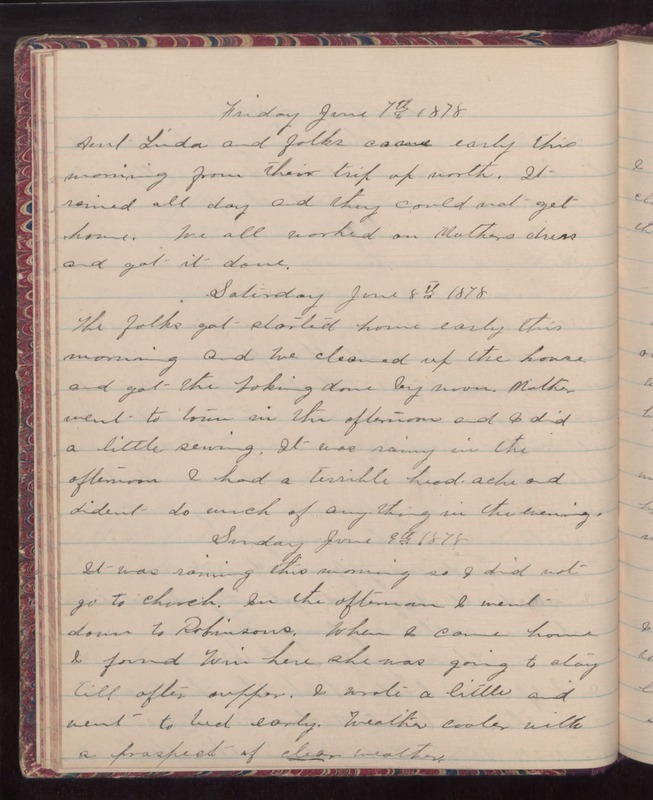 Friday June 7th 1878 Aunt Lida and folks came early this morning from their trip up north. It rained all day and they could not get home. We all worked on Mothers dress and got it done. Saturday June 8th 1878 The folks got started home early this morning and we cleaned up the house and got the baking done by noon. Mother went to town in the afternoon and I did a little sewing. It was rainy in the afternoon. I had a terrible headache and didn't do much of anything in the evening. Sunday June 9th 1878 It was raining this morning so I did not go to church. In the afternoon I went down to Robinsons. When I came home I found Win here she was going to stay till after supper. I wrote a letter and went to bed early. Weather cooler with a prospect of clear weather.